It is well-known that Henry VIII wanted to make official his relationship Anne Boleyn when he was already married to Catherine of Aragon. According to Paul G. Friendmann’s chronology, the case of the divorce between Henry VIII and his Queen started at Westminster in May 1527. The Pope, Clement VII, who was the only authority to grant him that request, was against that idea and refused to give him a dispensation of marriage. Year after year, a frustrated Henry VIII tried everything to have it his way but nothing seemed to be working. So how was he going to get a divorce from his then queen Catherine of Aragon since Clement VII would not grant him that divorce? The answer was simple, write an Act and make it pass by Parliament! No one could refuse anything to Henry VIII, not even the Pope and Henry was ready to show him that even after all this time, he would not take no for an answer! The Act, written by the King and his advisors, one of whom was the cunning Thomas Cromwell, was passed in April 1533. It was called the Act in Restraints of Appeals, and was also known as The Act of Appeals. Let’s explore the content of that Act. It starts with the words ”where by divers sundry old authentic histories and chronicles it is manifestly declared and expressed that this realm of England is an empire, and so hath been accepted in the world, governed by one supreme head and king”. The beginning of that act gives many directions. First of all, Henry VIII was internationally recognized as the Head of England and it had been such for the previous kings. Why say so if people have known it for years and years ? It is more likely that the authors wanted to establish the authority of the king in the very first lines of the act to give a strong impact to what was coming next. As a matter of fact, the king was accepted by the world as the Head of his country but also, the king was ”furnished by the goodness and sufferance of Almighty God with plenary, whole and entire power, pre-eminence, authority […] to render and yield justice.” At that time, the king was God’s representant on the Earth but the Pope was the one giving justice in terms of religious matters. Now, what is said, is that Henry VIII was now able to treat any case without having to ask to Clement VII. As a matter of fact, according the authors of the Act, God, who was above the Pope, had given full authority to run his country and take the decisions regarding his realm as he wished. Very clever, the Pope’s authority was vanishing little by little! To give it even more credibility, the Act mentioned the king’s ”most noble progenitors” such as ”King Edward I, Edward III, Richard II, Richard IV” who ”made sundry ordinances, laws, statutes and provisions for the entire and sure conservation of the […] said imperial crown of this realm.” Henry VIII was not the only one to impose new laws and acts and since, kings were used to enforce new acts, nobody would refute or question that one. After all, was Henry VIII not eligible on the list of those most noble progenitors? Now we are getting to the most important part. What were the causes among those old ordinances and acts? There were ”causes testamentary, causes of matrimony and divorces, rights of tithes, oblations and obventions”. There we have it ! Matrimony and divorces. The most important words for Henry VIII at the time ! A whole text for two words, can you believe it ? Now, that being said, Catherine of Aragon would not remain Queen for a very long time since the very aim of that Act was to get a divorce in order for the King to make official his secret marriage to Anne Boleyn on January, 25th 1533. So even with a refusal from the Pope, Henry VIII already had his way. Finally, the Act stipulated that ”the great distance of way is so far out of this realm, so that the necessary proofs nor the true knowledge of the cause can neither there be so well-known nor the witnesses there so well examined as within this realm.” The Act explained that it would be cheaper easier and faster to treat a case in England rather than send it to Rome and eternally wait for an answer. Or in Henry VIII’s case, be turned down. Through that Act of Appeals, the authors wanted to give the idea that it would be beneficial for the realm of England when it was a selfish gesture to serve the king of England. The outcome of all those actions cost him excommunication from the Roman Catholic Church. Now free to act as he wished in his realm, no doubt that Henry VIII would finally become the all-powerful king with unlimited resources to his every desire which were numerous. That would be verified very fast as in April 1533, the very same month and year the Act of Appeals was passed by Parliament, Anne Boleyn appeared as Queen of England and the King ”begged the Lords to go and visit and make their court to the new Queen, whom he intended to have solemnly crowned after Easter.” That event occurred on 31st of May1533, two days after Thomas Cranmer, Archbishop of Canterbury, declared the invalidity of the marriage between Henry VIII and Catherine of Aragon. 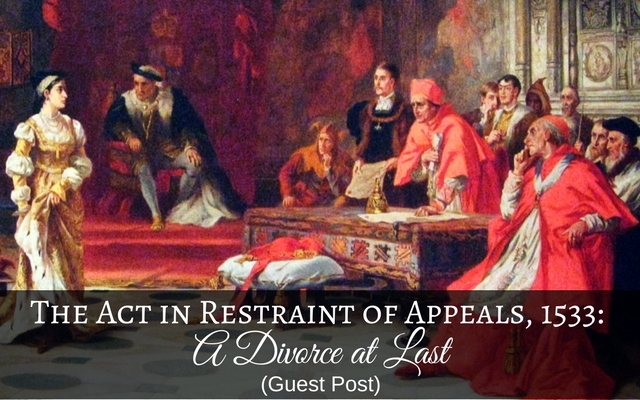 Does anyone know where I can find online access to the full text of the Act in Restraint of Appeals?